The music legend’s USA-European tour stopped in Oklahoma City’s Chesapeake Energy Arena for a phenomenal night of entertainment. Before Mr. Clapton hit the stage, his opening act: The Wallflowers took the stage to perform a mini set of their tunes but ran into several problems during their duration on stage. Throughout the set, it seemed that the Wallflowers’ sound was muffled and concertgoers could not hear them. In addition, the group’s keyboardist, Rami Jaffe, drowned the band with his boisterous banging. Another factor that distracted several audience members was the distinct smell of weed that was coming from section 106. Despite all of this, Jakob Dylan, who looks and exactly sounds like a younger version of his famous father, led the group in performing some of their newer material: “Love is a Country” and their signature songs: “6th Avenue Heartache,” “One Headlight” and “Peace, Love and Understanding,” which redeemed their set. After a 15-minute swapping of instruments, the Rock and Roll Hall of Famer took the stage with his band that began a night filled of incredible moments. Mr. Clapton started off his set with several acoustic versions of “Hello Old Friend” and “My Father’s Eyes” before he transitioned to an electric set to perform his hit off of his current album, Old Sock, “Gotta Get Over.” While Chaka Khan was not available to join in on the fun, Clapton’s backing singers: Michelle John and Sharon White were able to handle the chorus licks. Many audience members were transfixed while watching Mr. Clapton play his various guitars. 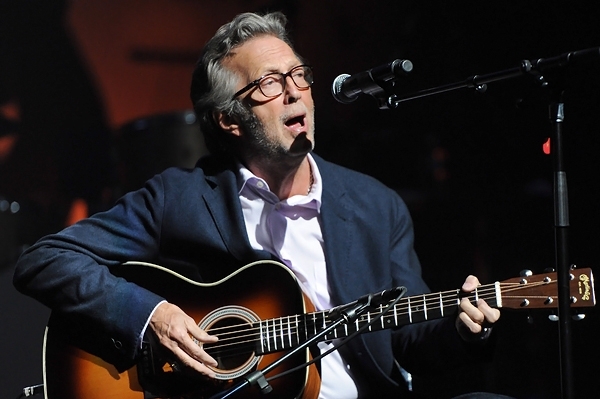 With each riff and song, the audience felt that they time-traveled throughout Mr. Clapton’s celebrated 50-year career. In addition, the light show’s illumination helped the audience visualize a majority of the songs. Halfway through the concert, the music legend tackled several of his classics including “Tears in Heaven,” “Lay Down Sally,” “Wonderful Tonight” and “Layla.” As he played each song, the audience sang and dance that made everyone realize why the Rolling Stone named Eric Clapton the second best guitarist of all-time. Clapton ended the concert with rousing version of “Cocaine” and “Sunshine of Your Love” that got the crowd onto its feet.